Last Saturday, Al, Kelly from Williams Lake, Trevor, and myself ran the Blackwater River, about 80 km southwest of Prince George. The Blackwater is located near the historic Carrier-Sekani Grease Trail, which Alexander Mackenzie used as an inland route to find the west coast of Canada 215 years ago. The River has been proclaimed a BC Heritage River. In summer levels, the Blackwater is reknowned amongst experienced whitewater canoeiests for river tripping. 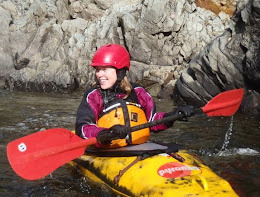 In the high waters of late-spring, it's an amazing intermediate whitewater kayak run. The stretch we did starts where the Blackwater Road crosses the river, and goes until just before the Fraser River confluence --- 28 km long. Picture below is our lunch spot --- a rock in the middle of the river to avoid the fierce mosquitos. Note the log just above water level in the background. The character of the river is continuous pool-drop grade II-II+ rapids, with a number of grade III rapids throughout. 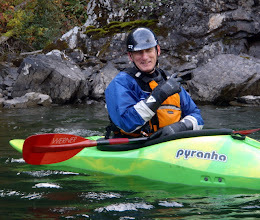 The final canyon is the most impressive, and also has the most challenging whitewater. We hiked up on river left to scout this one, which was a bit of a bush-whack but a good call nonetheless. There was one river wide log at water level about half way through. Here's a couple shots below of T-Star looking sharp for the birdie: Note on the take-out: modern short kayaks and high levels on the Fraser River basically make getting to the normal take out as written in our guidebook impossible. A couple years ago, we found a new take-out trail that is now the preferred alternative. From ~ 16.5 km on the Tako Road, head south on the Tako "F" Road, staying on the main "F" road. This year they've fixed the road, and now there's only one short section about 200 m from where you park that requires 4 x 4. The trail head at the parking spot has old signs, and leads all the way down to the Blackwater ~ 500 m upstream of the Fraser River. To recognize this while on the Blackwater, look for a bunch of pink ribbon on river left about 1 km past the final rapid, about ~ 500 m past a cable-trolley carriage that crosses the river. Follow the quad trail from the river to the parking spot --- a solid 30 minute hike uphill. 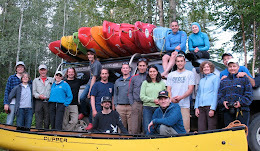 Last Sunday, a gaggle of paddlers descended on the beautiful Stellako River. Located about 2 hours west of PG just off highway 16, the Stellako flows from Francois Lake to Fraser Lake. Considered by many to be a world class fishing river, the Stellako is well known amongst anglers --- particularly for it's sockeye run in the fall. In the high waters of late spring, it's also a fun novice whitewater run. All of the rapids are straight forward grade II, with an optional "waterfall" section (grade III/IV) that can be easily portaged. Check our guidebook for more specific information. My favourite part of this river has to be the scenery - it's in a deep and gorgeous canyon as seen below. From the put-in on our descent, Deanna and Cynthia were practicing their rolls and eddy turns the whole way down, and looked very solid through the rapids. After reaching the "waterfall" section, we all got out for a scout. Here, the river splits into two channels and drops over a number of ledges. The left channel is where the biggest drop is (grade IV), while the right channel is easier (grade III). Here's the boys scouting the bigger one. Having seen the falls several times before in lower water from a canoe, I was convinced I was going to run it as I recall it looked reasonably straight forward. However my plan changed rather quickly when I got a look --- not so tidy looking in high water. Instead I cheered Ian on while he made it look easy (below). Startling! But he flushed out and rolled up. Nice work All!! Needless to say I took the chicken line through the river right channel. After the Stellako, we decided to stop and check out the nearby Nautley River for surf. Levels were very high here as well, and the waves looked great, so we gave er' a whirl. Unfortunately, their was no eddy service and the challenge was slowing down enough to catch the waves. Once I figured it out, I thought it was pretty fun despite the walk back up. That's all from Fort Fraser and beyond. Great trip, and thanks again to Deanna and Lyle for driving, Cynthia for keeping us well fed, Ian for the inspiration, and Al for the comic relief. Stay tuned for the next adventure! !